School was in session on Thursday afternoon, as I attended a preview event for the next entry in the Professor Layton series for Nintendo DS. It was held at the charming Gloucester Inn in Toronto, and I got about 45 minutes of hands-on time with the game. Impressions of the game and more on one of the most entertaining events I've been to after the jump. 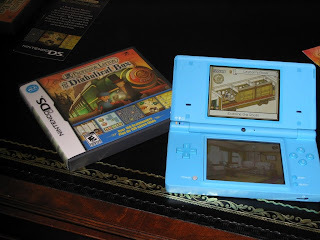 Professor Layton and the Diabolical Box is the follow-up to the moderately successful debut in the series, Professor Layton and the Curious Village. I say "moderately", despite the high quality of the game, sales were not exactly stellar for the first entry, and there was some speculation as to whether or not the follow-ups would even make it to North America. Thankfully, we don't have to worry what that might have been like, because the next game is here and looking great. 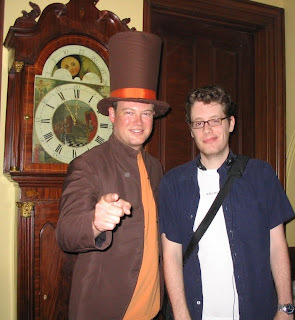 If you're unfamiliar with the series, PL:DB will offer you the chance to follow the Professor and his trusty apprentice Luke through a series of mysteries, which will be solved with the combined power of your DS stylus and those brain cells you've been slowly killing with alcohol over the years! From what I saw of the game, it looks like it will take place primarily upon an old-fashioned steam train, a proper location for intrigue if I ever saw one. The graphics appear to be largely the same as the first game, with characters having a cartoon style. The backgrounds are as beautiful as ever to look at, and you'll want to examine them closely for hint coins. Hint coins can in turn be used to make the over 150 puzzles you'll encounter a bit easier. Trust me when I say that some of the puzzles will make you spend coins like Paul spends twenties at the gentleman's club, and that is something to see my friends. "Charm" is a word I feel very comfortable applying to the Professor Layton series. Everything from the characters to the environments to the music are pleasing to the eyes and ears. It's the perfect game for a rainy summer evening, if there can be such a claim. I strongly recommend checking it out when it hits retail stores on August 24th. Stay tuned to NGP for the full review. According to Vgchartz, the first Layton game has currently sold around 830,000 copies in North America. That's actually fantastic for a DS game that wasn't from Nintendo. The good reviews and TV ads must have spiked sales in the later months. That should help the chances of future Layton games coming here. I hope we'll see all future Professor Layton titles here in North America. It's a great series for puzzle lovers.